Maple and Syrup spend most of their time in the lush gardens surrounding the kitchen area of Moy Mell. They've made friends with most of the Cadaceus Chameleons and often enlist their help when prowling for their favorite foods in the chef's herb garden. Needless to say, they drive him to distraction and he often refers to them as "emergency food supplies #1 and #2". 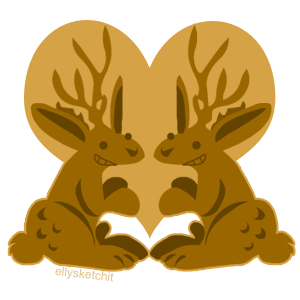 The two bunnies are loyal to each other to the point of distraction and play a sort of matchmaking role throughout the Keep, bringing people together through many wonderful and romantic methods.